Hand made 18ct white gold diamond earrings set with 2 x 1.01ct Gsi2 GIA certified TripleEx H&A™ centre diamonds. 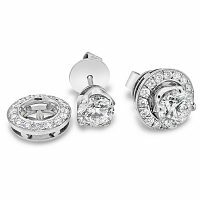 These can be worn as studs or the diamond halos attached giving a large splash of diamonds. Total diamond weight for the halos is 0.50ct.